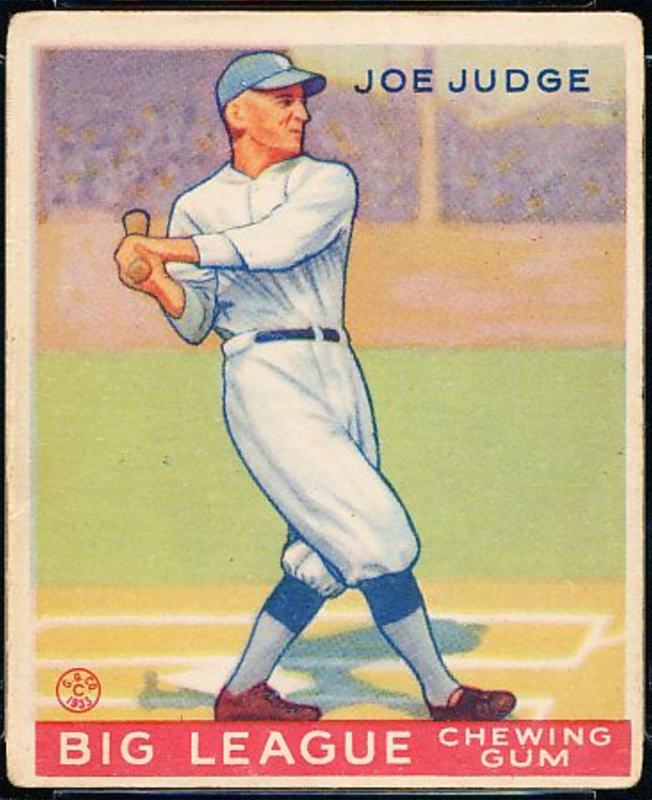 The 1930s produced great vintage sets, including some of my favorite individual cards. Those blue lines and bloused uniform, wow. Such clean, outstanding work. 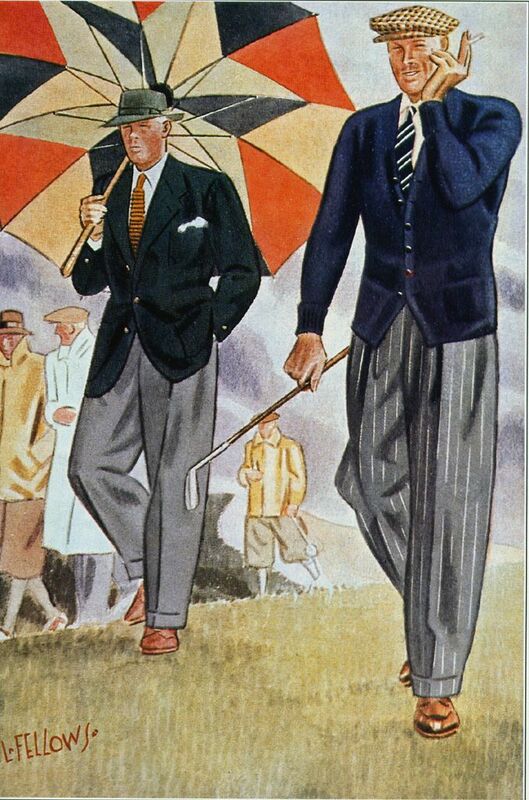 Hand-tinted, line-heavy figures like this Joe Judge reflect similar Art Deco stylings of the era. Boston gum competitors National Chicle and Goudey, top card makers of the 1930s, each took a shot at on-card Deco, possibly sharing the same on-card artists, since both companies operated just a few miles apart in Boston and Cambridge, MA. National Chicle made "Diamond Stars Gum" in that style and it still looks great. Artists hand-painted each player from photos, adding spirit and depth to black-and-white originals. 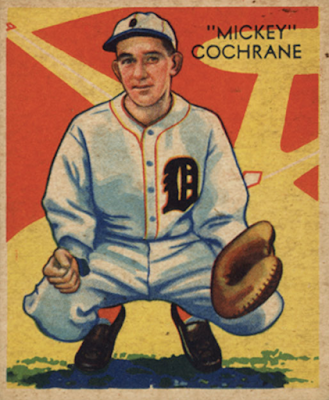 As with Mickey Cochrane, they often swapped out realistic backgrounds for something more artistic. But painted pieces don't tell the whole story. 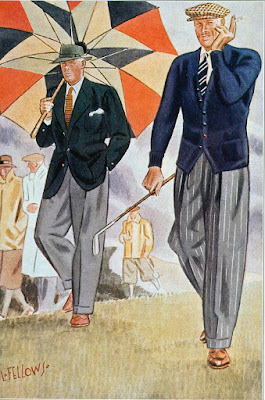 As the Great Depression deepened and fewer fans had pocket change for luxuries, card makers cut costs by creating less "artistic" options to offer alongside their fancier packs. Both companies printed batches of postcard-sized "premium" photos later catalogued as R313 (National Chicle) and R314 (Goudey). Collectors swapped their card wrappers for these photo premiums in stores or via mail. Since R313 and R314 black-and-white premiums aren't as familiar to modern collectors, let's look at five of them to get a feel for their style. Most R313s show player portraits, but several were action shots with descriptions scrawled on the front. 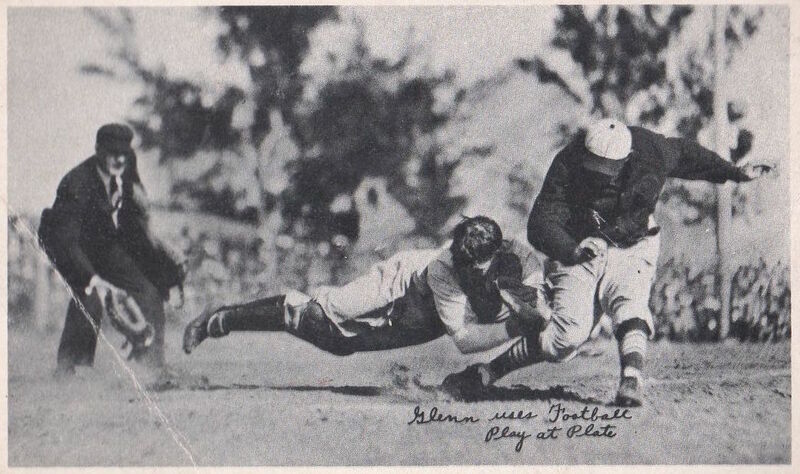 I had to Google "Chicago City Series" for more context on this play at first. 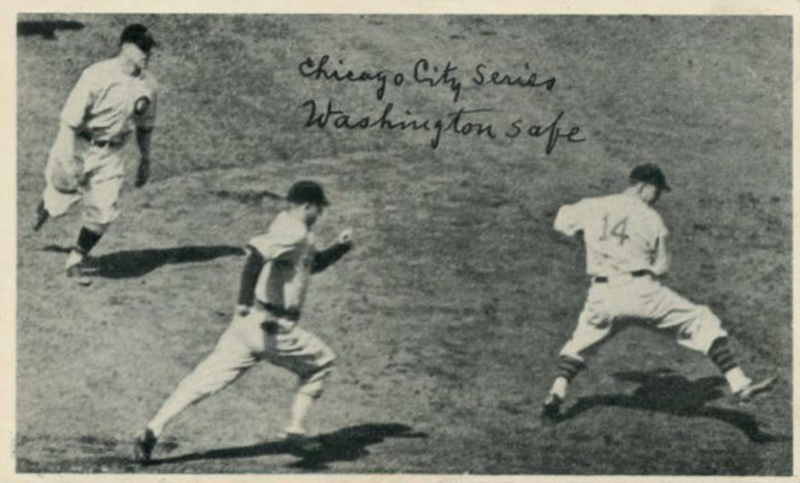 I'm not aware of play-by-play from these games, so can't say for sure what play this photo shows, apart from White Sox OF George Washington about to beat #14 (Cubs P Larry French) to first base, as French searches for the bag with a raised foot. The play below's much more dramatic than #1's infielder grounder and could easily send a guy to the locker room for x-rays. I mean, look at that knee, ouch. This 1936 photo shows a dynamic Joe DiMaggio tracking his shot to left field and headed for first. 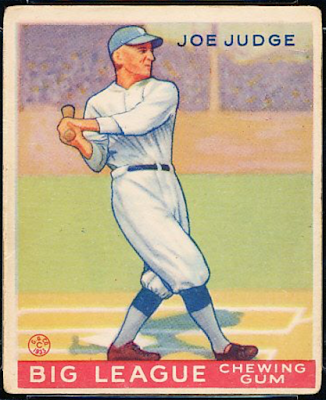 It's one of Joe's earliest pro images and perhaps his first card in a real Yankee uniform. 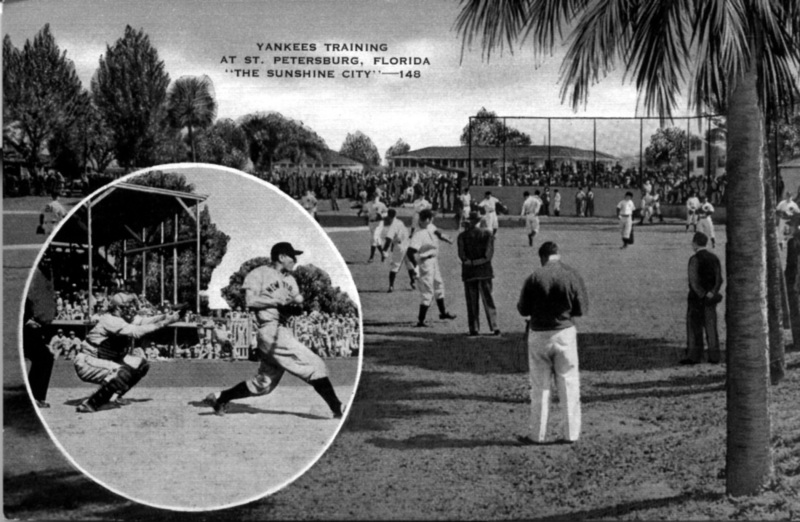 We know this is spring training in part because Joe entered Yankee camp as #18, but changed numbers by Opening Day. "Erickson catching" is Reds backstop Hank Erickson, who played sparingly in 1935 and failed to stick in the bigs for 1936 (career stats). This is Hank's only card in a Cincy uniform and he appeared on just one other during his career, as a minor-league Toronto Maple Leaf on Goudey's aforementioned R314 Premiums. Remember that tree earlier? Look behind Joe and you'll recognize the same limb and leaf structure. Also compare the angled roof above that umpire to the circular inset on this postcard from New York's St. Petersburg training site. It confirms where we are: the ball fields at Crescent Lake Park. Given the similarity in camera angles, I suspect both card photos come from the same 1936 Yankees vs. Reds spring training game. It wouldn't be the first or last time a card maker saved money by creating several cards from the same game! 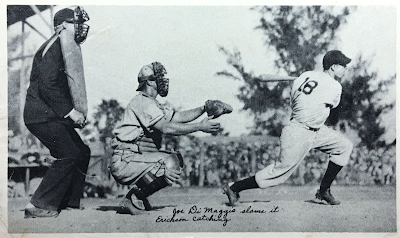 TIP: Want a DiMaggio card from his playing days? This R313 remains his most affordable, running $100-300 in low grade. 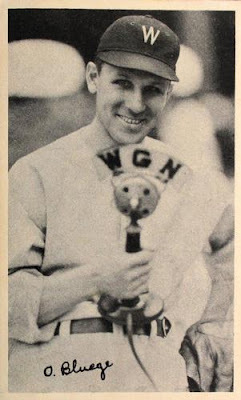 This candid of lifelong Washington Senator Oswald Bluege holding a WGN microphone is ahead of its time and would be right at home in a modern Topps set. High five to National Chicle for including something so whimsical at a time when baseball served as an important distraction from the Great Depression for many Americans. The immortal Honus holding a baseball. That works for me. 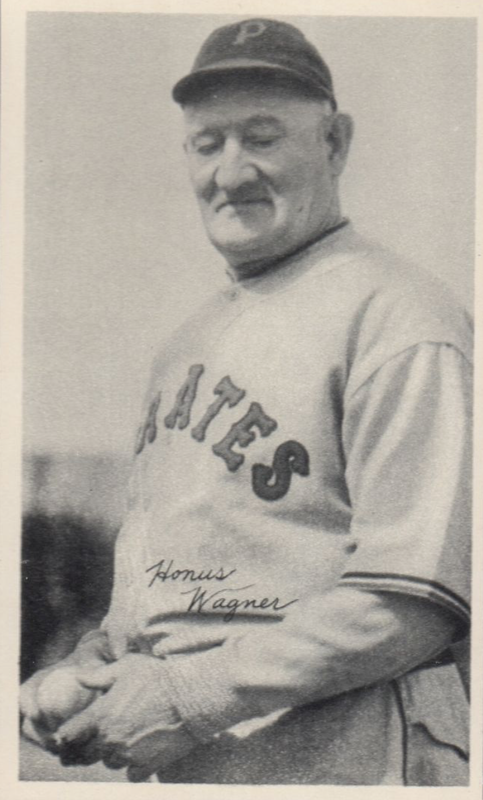 Wagner turned 62 in 1936 and was inducted that year as part of baseball's "first Hall of Fame class" with Ruth, Cobb, Mathewson, and Walter Johnson. He's shown in uniform as the Pirates hitting instructor and continued in that capacity through 1952. 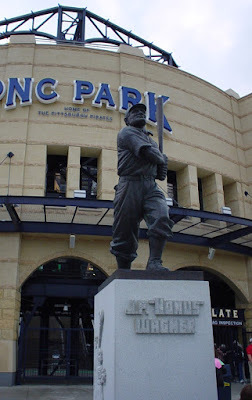 If you're ever in Pittsburgh and stop by its terrific PNC Park, you can still touch history by visiting the Honus Wagner statue. The Flying Dutchman himself attended its unveiling in 1955 and his likeness followed the Pirates to a pair of new ballparks since. The past is never far away! Amazing stuff. That DiMaggio card is truly historic. Lot's of great stuff in this post. But wow... that DiMaggio is the cream of the crop. It's a work of art. Great insight into baseball and collecting history. Thanks all! This set's not well known because of its postcard size, but lots of fun stuff in it.